Build your squadron of tanks and battle it out to see who can earn the most medals and become the victor! If the name is any indicator, there are more than 80 different tanks in World of Tanks: Rush! 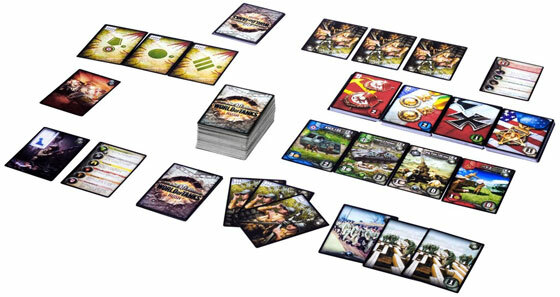 Based off of the popular online game World of Tanks, this card game version does a great job at bringing tank battles to your table, while not worrying about trying to replicate the online game. Players take the role of squad commanders, acquiring tanks and balancing whether to use them for defense or offense. Once you’ve played it a couple times, the “Rush” part of the name kicks in and games become even more quick and fun. Setup is fast and easy, and because of this we won’t go into the details except to talk a bit about what gives this game a ton of replayability… the achievement cards. Each game you randomly draw a number of achievement cards equal to the number of players plus one. These achievements are awarded at the end of the game, and involve having acquired or earned the most of something; like having the most cards, purchasing the most of a certain type of vehicle, or earning the most medals from a specific country. There are 12 different achievements, so each game you play will be different. There are many ways to earn medals (victory points) throughout the game, but the achievements award the most medals, and are key to winning the game. World of Tanks: Rush is a deck building game at its core. You start with a basic deck of six cards that provide you with resources and actions focused mainly on acquiring new vehicles. You will only be drawing three cards each turn, so managing your deck so that it is effective each turn is crucial. When you purchase one or more cards, they go into your discard pile. When you need to draw a card but have none left in your draw pile, you shuffle your discard pile and then place them face down to create a new draw pile. Each player starts with three bases. A base is worth three medals to the player who destroys it, and the game ends after one final round after one player’s bases have all been destroyed. If you destroy someone’s base, the card goes into your deck, but doesn’t provide any actions or resources when you draw it, so you don’t want to flood your deck too early with base cards. It might seem like you would want to defend your bases as quickly as possible, but there are also times where you might find that it is better to leave them undefended. You also don’t receive medals at the end of the game for your bases still in play. The game definitely encourages players to get out there and attack over being overly defensive. In the center of the table is the Vehicle deck. At the start of the game you draw four cards from the deck and place them in a single row face up. These make up the reserves; the tanks and other vehicle cards the players will be purchasing throughout the game. The reserves go through a cycling process. If you buy a card, you move the cards to the right, so the left-most spot is empty, then draw a new card to fill its place. At the end of a player’s turn, the card furthest from the vehicle deck is discarded, the other cards move to the right, and the empty spot is filled with a new card. This means if you don’t buy a tank you want on your turn, it is very likely it won’t be there on your next turn, especially if you’re playing with more than two players. The cards you purchase will eventually cycle from your discard pile back into your draw deck, and when they are drawn into your hand they can be used for attacking, defending, special actions or purchasing another vehicle. On your turn you first repair damage by simply turning your cards upright that were were turned sideways on another player’s turn because they were damaged but not destroyed. Next you reveal your hand of typically three cards (that you drew from your own draw deck at the end of your previous turn). Use it’s resources to purchase a vehicle from the reserves (you can combine the resources of multiple cards). Use the card’s special abilities and then place it on top of one of your base cards as a defender. Use one or more vehicles (of the same country) to attack enemy bases or vehicles. Not every vehicle has a special ability, but those that do can greatly improve the effectiveness of your deck. Special abilities include allowing you to draw more cards, refine your deck by trashing cards you no longer need, making other players discard a card, etc. When you choose to use a vehicle for its special ability, after you’ve performed those actions, and as long as the vehicle has at least 1 armor, you place it in front of one of your bases as a defender. If all of your bases have defending vehicles, you must replace one, putting the old vehicle in your discard pile (which is a great way to get vehicles with special abilities back into your deck). It’s important to watch what countries the vehicles are from that you purchase because it will greatly impact how effective your deck is in battle. You can only launch one assault on your turn, but you can use multiple vehicles in that assault if those vehicles are from the same country. To launch an assault you choose the vehicles from your hand (from the same country, that have at least 1 attack power) that you want to use, and then one vehicle at a time make your attacks. If an enemy base has a defending vehicle, you must attack/destroy the vehicle before you can attack the base. If you target a vehicle, and its armor is equal to or less than the attack power of your vehicle, it is destroyed. If its armor is greater than your attack power, it is damaged (turned sideways). A damaged vehicle is automatically destroyed if it is attacked by another vehicle (as long as the attacking vehicle has at least 1 power). Since player have multiple bases, you can choose to attack an undefended base if you want. To destroy a base, you either have to attack it with two vehicles (damaging it with the first, and destroying it with the second), or attack with a heavy tank. There are vehicles that have two attack power like heavy tanks, but only heavy tanks can destroy a base in one attack. Once your turn is over, you collect one medal for each enemy vehicle you destroyed. You don’t collect medals for destroyed bases because you get to take the destroyed base card that is already worth three medals. Each country has a set of 9 one-medal cards and 3 two-medal cards. The medals you take must mach the country of the vehicles you attacked with. If you’ve destroyed two or more vehicles, it is wise to take a two-medal card if available. Medal cards go into your discard pile, but unlike base cards, medal cards also can be used for resources. This is why taking one two-medal card is better than taking two one-medal cards, since you only draw three cards each turn. Once one player’s bases have all been destroyed, or the last one-medal card from one country has been taken, play continues until it gets to the player who started the game. Then it’s time to determine who receives the achievements and then total up everyone’s medals. If two or more players tie for an achievement, no one receives it. The player with the most medals wins! For a game with 100 vehicle cards, you might expect to see some duplicate tanks, but that is not the case with World of Tanks: Rush. Each tank name and illustration is unique, and the artwork and design of the cards is superb. The game definitely took advantage of the artists behind the digital version of the game. The card quality is also very nice and thick, and the reference cards come in very handy when you’re wanting to remember what a specific ability symbol means. World of Tanks: Rush is easy to learn, and easier to teach. The special abilities do add a bit a complexity, but it is welcome because they also add to the strategies you can explore. If you don’t focus on the WWII theme, and instead focus on battling tanks, this could be a fun game for the family. The mechanics are easy to learn and teach, but there are some deeper strategies that might be harder for young children to grasp. The game is quick to play, but it’s not something you’d pull out in a party setting. There is plenty of strategy in this game, but there is also a lot of luck involved in the cards being drawn that would turn strategy purists away. Once you’ve got a play or two under your belt, the games are quick and fun. If you’re also into tanks and the WWII theme, then this is a must have. World of Tanks: Rush has done a great job at taking familiar mechanics and combining them in a unique and fun way. This is the perfect game if you’re wanting to play a World War themed game, but want something that won’t take hours to play. Or if you do plan to play for hours, you’ll be able to get multiple games in! Power gamers who enjoy World War themed games are probably going to prefer pulling out their war games or miniatures games. But if you’re looking for a game you could play with friends and family in a more casual setting, this is definitely a great game to have in your collection. When it comes to games about war, specifically the World Wars, many of them tend to be large in scale, fairly complex in their strategies, and require a decent investment of time. This makes World of Tanks: Rush a very welcome game in the genre. It takes the theme and makes it quick and accessible. Like we stated above, it’s also a great way for fans of wargames to play a war themed game with more casual gamers. An interesting twist is that in World of Tanks: Rush the luck lies in the drawing of cards, while battles are clearly defined. There is no dice rolling to see if your attacks are successful, and there are no surprise cards that an opponent can pull out to thwart your assault. How does this game compare to other deck building games? We felt it was a breath of fresh air because of the high amount of player interaction it had. You won’t be able to put your head down and play a game of deck building solitaire. Also, in games like Dominion, we’ve found that because the major focus is on your own deck, many of those we’ve played with don’t enjoy the cards that effect other players (like giving curses). Yes, it can hurt to have your tanks and bases destroyed, but it’s expected and all part of the fun. We really enjoyed the quick gameplay and especially enjoyed how the achievements chosen for each game made the goals and strategies different. There is definitely a lot of replay value in this game, and if your a fan of the online game as well as board games, this is a must have! World of Tanks: Rush will be available in the US March 2014. World of Tanks, a popular online game, comes alive on your table! The World of Tanks: Rush game has been illustrated by the same artists that have worked on the original digital version of the game and uses the same original artwork, terminology and other elements. In World of Tanks: Rush each player assumes the role of a tank squad commander. The main goal of the game is to strategically select cards from the reserve to form a strong squad. Players will lead their tanks into battle, defend their own bases, call for reinforcements and receive medals. come up with your own terminology for things as some of it is distracting, and ignore fact there are medals awarded and medals as cards, may of helped having two names, but if that’s the only flaw then so be it. 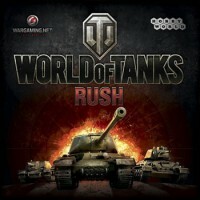 Add a Review for "World of Tanks: Rush"